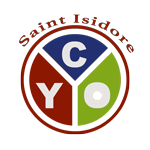 Please join your fellow youth of St. Isidore Parish, get exercise and build long term friendships by joining our Track and Field team. Open to all students at St Isidore's and PREP students. Boys and Girls born between September 1, 2003 and December 31, 2009. Grades 4-8. Mon, Tues & Thurs from 6:00 to 8:00pm @ the Freshman Center. Meets on usually one day on the weekend (typically Sat or Sun) - there are a few Wed evening meets as well. All kids would need to attend at least 3 meets to qualify for the Regional meet that would then allow them to advance to the Districts etc if he/she is a top placer for any event. With me, if you run track you try all events at least once - you do not know what you like until you try it. Track is pretty laid back overall but I do expect them to run hard & give it their all when they are at practice/meet. Events are: 100M, 200M, 400M, 800M, 1600M, Relays, Shot Put, Long Jump, and High Jump.